Among the privileged few who had interactions with Warren Buffett when he visited India in March, was Aryaman Dalmia,who met the billionaire investor for a full 15 minutes. What prompted the meeting? 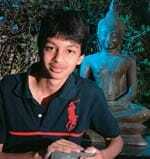 A book, titled Graham, Buffett & Me, Aryaman, 14, has just written. It profiles Indian investors and was sparked off by a newspaper report on Buffett that Aryaman's father - Landmark Holdings CEO and private equity investor Gaurav Dalmia - suggested he read. His interest whetted, Aryaman did not stop with the report. He read the standard Buffett biography Oracle of Omaha and a few more books on the world's third richest man before penning his own. "I never thought I could write a book, and that too about investors," he says. "I knew a couple of investors and my uncle introduced me to some more. I have written on how these Indian investors followed Buffett and have been successful." Will he grow up to be an investor, a full-time author, or both? Too early to tell. 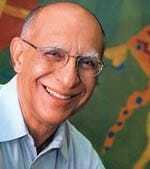 That Ashok Soota, 63, quit MindTree, the company he founded in 1999 along with eight others, because his relations with his co-founders soured, is apparent from the initial business plan of his new start-up, Happiest Minds. The new outfit is clearly aiming at MindTree's business. "I don't have a non-compete clause with MindTree," says Soota, adding: "We want to be the fastest Indian IT services firm to reach $100 million in revenues." For those in the know, this is again a potshot at MindTree, which achieved that target in a record six years. Meanwhile at MindTree, the remaining founders are busy adjusting to life after Soota. 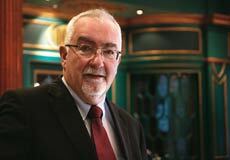 Their first step has been to appoint Albert Hieronimus, former chairman of Bosch India, as Soota's replacement. "I bring management experience and knowledge of global markets to the table," says Hieronimus, 62. Rajesh Kamat, 37, seems to be the 'launch man' of India entertainment industry. After successfully launching Colors for Viacom 18, he is all set to unveil the India operations of Peter Chernin's CA Media. He will take over as CEO of CA Media after June. From a management trainee at Coke in 1997 and later brand manager at Thums Up, Kamat has come a long way. As the architect of Colors, he had a clear mandate - the channel should cement its position among the top three channels within a year of its launch. Colors broke Star Plus's hegemony within nine months and rest, as they say, is history. The channel has given some of the biggest hits of the small screen like Balika Badhu and Bigg Boss. "Media and entertainment sector is bustling. My new job will give me the opportunity to create a blueprint for leveraging such opportunities," he says. One just has to see whether he can create the same magic for Chernin that he did for Viacom 18. She discusses the subject so knowledgeably that anyone meeting Nadia Chauhan for the first time would think she had spent at least 15 years in the food and beverages business. It comes as a shock to learn she is only 25. 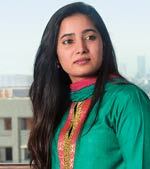 But her grasp of the business is not surprising: as a child, the youngest daughter of Parle Agro Chairman Prakash Chauhan spent her summer holidays sitting in on company marketing meetings. Today, she is the marketing brain behind the host of launches by the company since 2009. Parle Agro has launched several new brands such as LMN (a noncarbonated lemon drink), Hippo and Grappo Fizz in these two years. Recently, after more than a decade, it re-entered the soda segment with Bailley Soda. "In the last three years, we have launched several products. Our focus will be on consolidating our operations on these fronts," says Nadia. Rohit Kapoor, President and Chief Executive Officer of EXL Service, plans to make his $250-million company a $1-billion services major in seven years. For inspiration, he has Infosys and Cognizant as examples. Kapoor, however, rues the fact that EXL cofounder Vikram Talwar has stepped down as Executive Chairman and taken on an advisory role as the non-executive chairman at this juncture. "I will become lonelier," says Kapoor. Why? With his ambitious plans for the company, he could have used all the advice from Talwar. Did you know pop icon Madonna's bed travels with her? Singer Sir Elton John, TV mogul Oprah Winfrey and Harry Potter star Daniel Radcliffe are all besotted with their beds, too. All of them use beds made by Savoir Beds, a London company that has been manufacturing luxury beds, complete with handcrafted mattresses and box springs since 1905. "We use horsetail hair for the mattresses. The hair, when manually curled, acts like a spring," says Alistair Hughes, Managing Director of Savoir Beds. 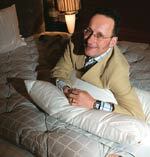 Hughes bought the beds' division from the Savoir Group in 1997. 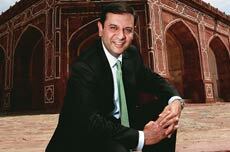 His first showroom in India opened at Delhi's upscale The Gallery recently. Hughes is not looking for scale - he says he would be happy to sell just eight beds a month. At between Rs 6 and 40 lakh each, that should make for a neat pile.